Dendrobium Orchid Care, The Important Points. Care: Beginner to advance, depending on species. Dendrobium is an impossibly large and very diverse genus of orchids with over 1000 species. The come from a wide area from Korea and Japan, Indonesia, Australia, New Zealand and New Guinea. In order to help understand this complex genus it is divided into section and the various sections are covered below. These various types have very different cultural needs. Some will go through a growth phase and then require a rest phase. Water and temperature for these rest periods must also match these periods. 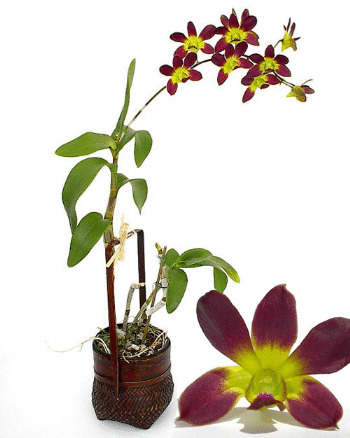 So basically with Dendrobiums the culture is very dependent on the type. Strong light is important especially when growth is maturing. Bright light, some sun. In the home a shaded south, east or west window. In the greenhouse, 25%-50% full sun. Less light is necessary when plants are in a rest phase. 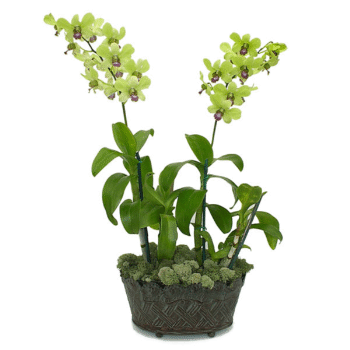 Temperatures needs vary widely depending on the particular kind of Dendrobium orchid. It is best to supply what the plant had in its natural environment. 45-60 degrees F. (7-15 C.) at night and 65–95 F. (18-35 C.) during the day. Most Dendrobiums will do well under intermediate (55-85 F.) conditions. Again because this is a large genus the Dendrobium orchid water requirements vary with the type of plant. Generally, when plants are growing water when the medium begins to dry. Some types need to become very dry when resting. DO NOT use water that has been water softened as it can kill your orchids. It is important to give the plant a complete drenching when you water. Thorough watering, letting mix dry out almost completely. Like most orchids Dendrobiums appreciate higher humidity than other house plants. Humidity should be between 40%-60 % to be optimum. In the home, placing the plants in orchid humidity trays is the best way to go. Some people like to increase the humidity by misting (which I am not a big fan of due to the possibility of increased risk of fungal disease) to increase the humidity. Humidity trays function by o putting a plate or saucer with little pebbles in it and put water in it. Put the orchids ABOVE the water. This increases the humidity around the plant. You can also use humidity trays very effectively. If you want to check out the ones I use Click here! 40-60% Humidity. A gentle circulation fan can help with this. Fertilizer needs to be supplied on a regular basis as the potting media has very little nutrients. Fertilize with a balanced formula every two weeks. Many growers use a 30-10-10 formulation on plants in a bark based medium and use a 20-20-20 for other media like cork bark, tree fern, sticks or slabs. I like to go with a dilute formulation at about 1/4 and 1/2 the recommended strength of the dilution. The adage is "weakly, weekly". That said it is best to reduce the amount of fertilizer during the winter months when most plants are not in active growth. This is particularly true for the Dendrobiums that require a rest period. That would be no water and no fertilizer. Do not fertilize orchids when they are dry. Fertilize when the plants are in active growth. Dilute (one half strength) of 30-30-30 biweekly during active growth. Consider using 10-30-20 (a blossom booster) when approaching bloom. These kinds of plants may be evergreen or deciduous depending on the circumstances and conditions. These plants have tall thin pseudobulbs. Flowers are on the end of the canes and tend to be in the autumn. species such as Den. affine, Den. bigibum (phalaenopsis) and Den williamsianum. Culture: Grow warm year round (60 F. nights.) Fertilize heavily when roots appear from new growth. Medium light is best. These are called antelope dendrobiums because the flowers have a pair of upright twisted petals that resemble the horns of an antelope. These plants are evergreen mostly and have no pseudobulbs. Culture: They need intermediate conditions throughout the year. These can be a little easier to grow than some of the others as they do not require a rest period. Species include Den. antennatum, Den. discolor, Den. strebloceras and Den. taurinum. Most of the plants in this group are pendulous with leaves along the canes. Mostly these drop their leaves with the onset of cooler, drier weather. Flowers are born on leafless canes in mid winter to spring. Group 1 Species such as chrysanthum, nobile, wardianum, friedricksianum. Culture: Growth period is in the summer, they want warmth, water and heavily fertilizer from when the roots appear until the top leaf appears on the canes. Then give high light little to no water, no fertilizer and cool nights (40-50 F.) In other words sort of forget about them. Group 2 Species such as anosmum (superbum), falconeri, heterocarpum (aureum), loddigesii, moniliforme, transparens. Culture: Culture is the same as Group 1 but the winter nights should be 55 F. The deciduous species need no water in the winter. Callista: These plants are evergreen plants and mostly have pseudobulbs. They tend to be pendent flowers usually in the shades of yellow, white or lavender. species known as Den. aggregatum (now properly lindleyi), and Den. densiflorum. Leaves are formed at the top of the pseudobulbs area large and leathery, the inflorescences erect and the flowers are commonly yellow-green. This group includes Den. atroviolaceum and Den. spectabile. Culture: Same as antelope types, but cooler and drier when resting in winter.